This post is the final instalment about a day so awesome it takes up two posts. If you haven’t already, go here and read part one first! … It was a great day for spotting wildlife, we had already seen a sun fish (I was gutted I didn’t get a photo of it), seals, oyster catchers, cormorants, and oodles of jellyfish. 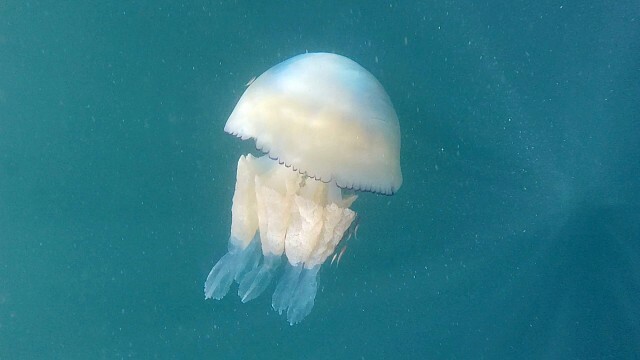 I had been experimenting with my GoPro filming the jellyfish underwater and managed to get a few great shots of this huge Barrel Jellyfish, including the one below. If you look closely you can see a small shoal of tiny fish on the right hand side of the Barrel Jellyfish, they were travelling along just inside the jellyfish’s bell. By this point in the day we were all pretty darn toasty, it was totally scorchio and we were keen to cool off. In one of the bays, there were many large, rocky outcrops. We found an island, which was covered in barnacle and mussles, it was large enough and flat enough to land the kayaks on. From here we swam and snorkelled. It was so refreshing to be in the ocean and cool off a little bit. There was actually a pretty small amount of predatory fish and we wondered how we had both been able to catch bass that morning. 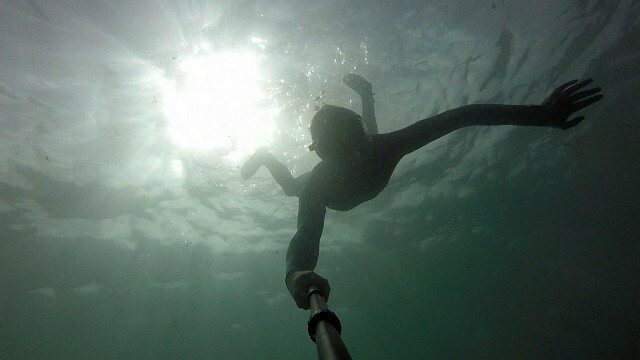 The water was crystal clear and with the aid of my Sandmarc Pole I was able to take some awesome shots. The bait fish had obviously also noticed that there weren’t many predators about and they were all out in force. The sea was brimming with huge shoals of sandeel and lance. 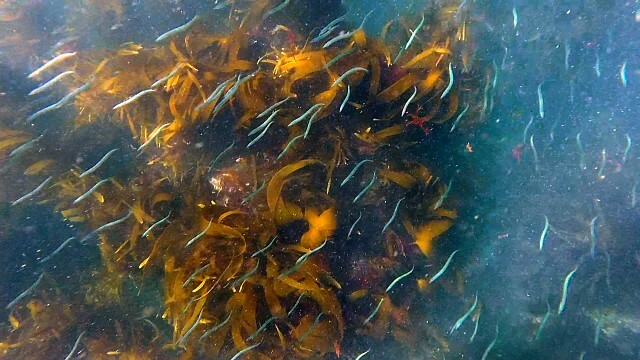 They seemed nonchalant to our presence and swam right along under us and through the kelp beds. We carried on snorkelling for ages, taking breaks to pop to the surface, check the kayaks hadn’t disappeared and maybe jump off a rock or two whilst we were at it. 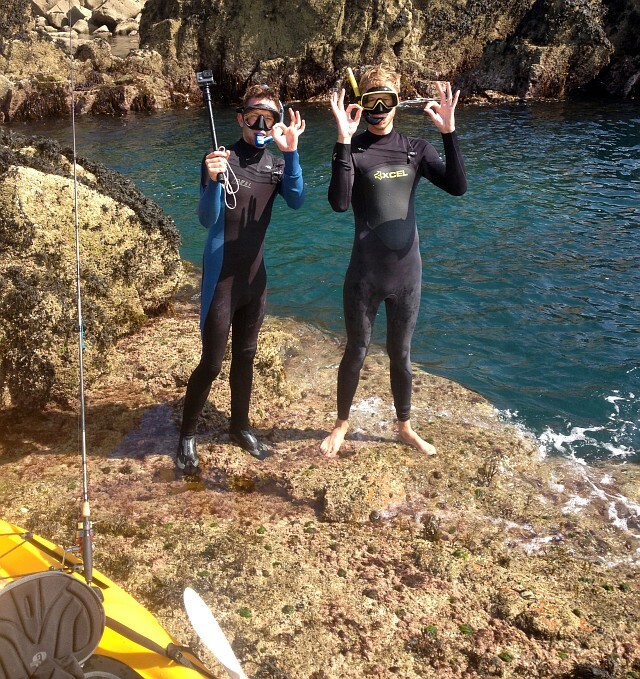 Diving down into the seaweed, we searched for brown or spider crabs or even more exciting, treasure! Unfortunately, we found none of these. I live in hope of a gold bullion filled treasure chest beneath the waves. We had now been out on the water for about 7 hours and it would be over 8 before we got back onto dry land. We started to make the return journey and back through one of the highlights of the trip, through a mammoth sea tunnel. From a distance, this tunnel appears as a dark fissure in the cliff. As you paddle into the crevasse, it gets a lot darker and you are surrounded by high cliff walls on either side. In front of you, disappearing into a rock, is a long tunnel with a very bright light on the other side. As you head towards the light (not in a death way!) the swell lifts, drops, pushes and pulls you through the tunnel. 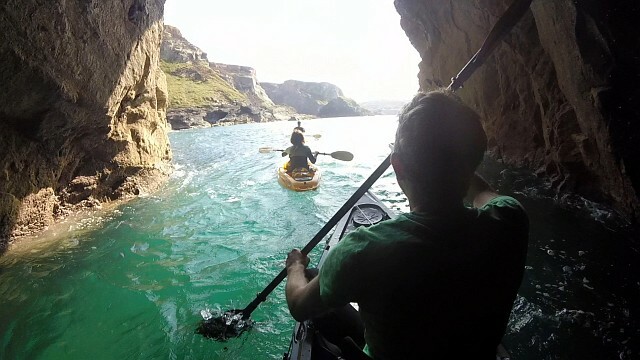 It’s great fun and really exciting, especially in as easily manoeuvrable kayak as the Fatyak Kaafu! 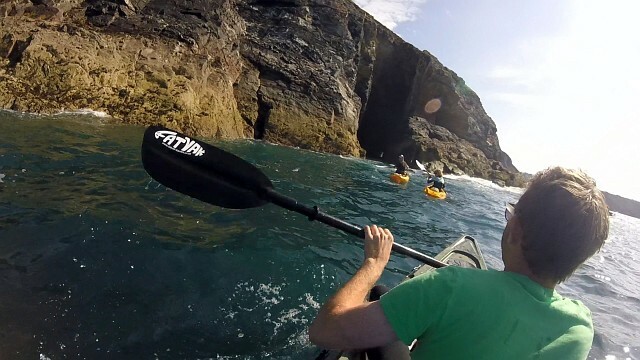 This is what makes the North Coast of Cornwall such an awesome place to kayak, you don’t get better than this! Emerging on the other side, the bright summer sun is so intense after the darkness of the tunnel. 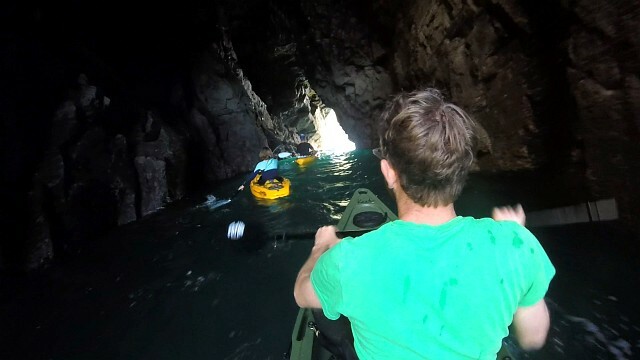 It was really good fun to go through in a convoy of kayaks. Paddling back to the beach where we had launched from over eight hours ago, I felt happy and drained, in the way you only can after a full day outdoors in the blazing sun. Thanks Cornwall!